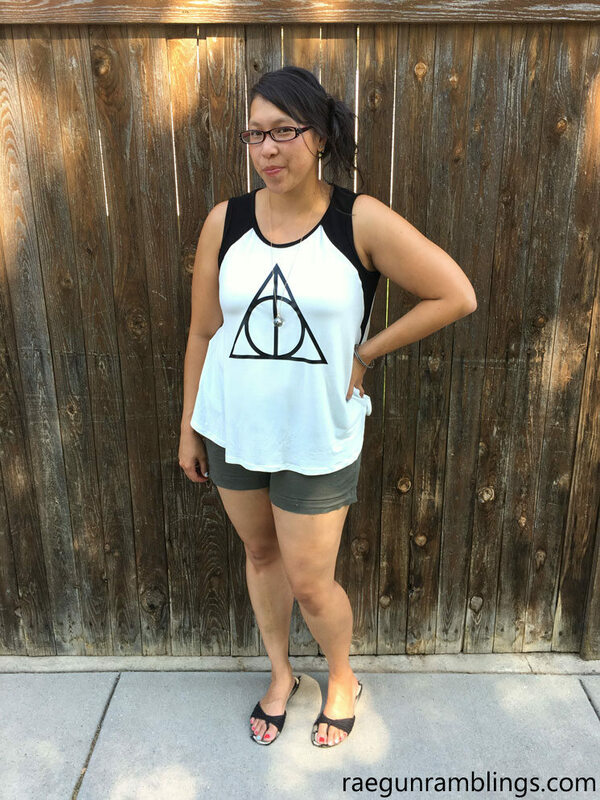 Are you ready for some awesome Harry Potter Fashion? 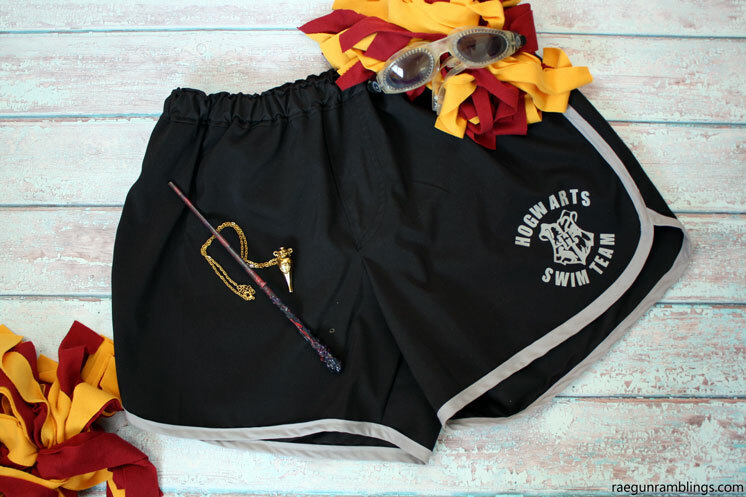 It’s the last Thursday of the month as well as Happy Harry Potter week 2 which means I’ve got a Sew Our Stash Harry Potter edition coming at you. And I have to say that I absolutely ADORE the two items I made for myself this month. I liked my shirts from last month and have worn them a ton but I squealed from delight when I finished my two pieces for this month. The first are these swim shorts. I used the Swim and Surf pattern by Gracious Threads along with some board short material that I got from Peek-a-boo Pattern Shop. 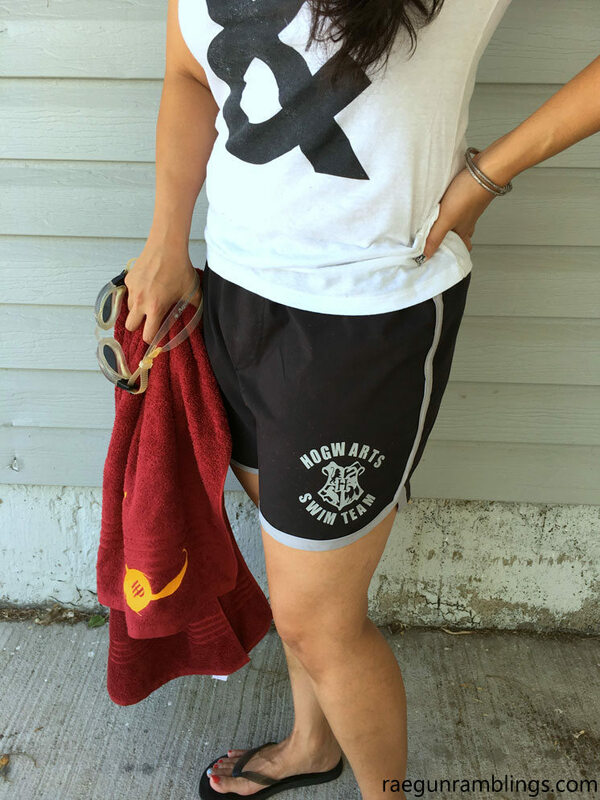 And I couldn’t resist attacking them with heat transfer vinyl to add Hogwarts Swim Team emblem to them with my Cricut explore. And you guys I TOTALLY love them. I made the size 16 in the Run (medium) length. I like it a lot but I think I’ll make the Swim (shortest) length next. I did the simplest version without a tie or eyelets and used regular elastic instead of multiple rows of swim elastic. I figure IF I wear them in the water and the elastic breaks down fast I can just open the casing and replace it easy peasy. If you’re looking for an easy and cute board short pattern I highly recommend this pattern. I will definitely be making more for myself! 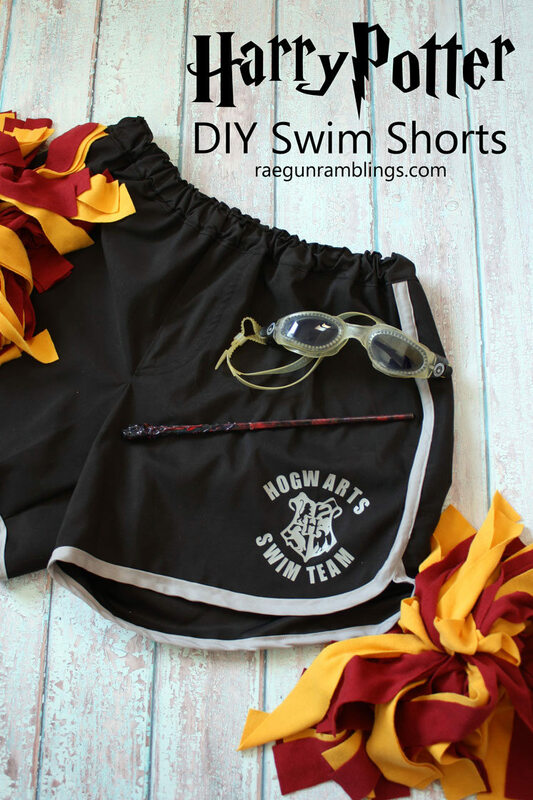 I’m sharing this as a part of the Summer Swimwear Tour hosted by by Call Ajaire, Gracious Threads, and The Wolf and the Tree to see more awesome DIY Swimwear, get discounts, and enter their fabulous giveaway see this post! I had originally planned on sharing my easy technique for making bias tape like I used on the shorts BUT I had some major technical issues so I’ll have to share that later. Now to my second creation the Santa Fe Top by Hey June Handmade. You all know I love Adrianna’s patterns. I seriously love this tank. I made the Large which was exactly what my measurements suggested I should make and I think it fits great. I love the flowy style and the various options. I’m excited to try both the more narrow tank version (this is the wider tank) as well as the actual sleeved versions. It came together SO fast I really can’t wait to make more. Goodness I really need to just cut out a bunch. 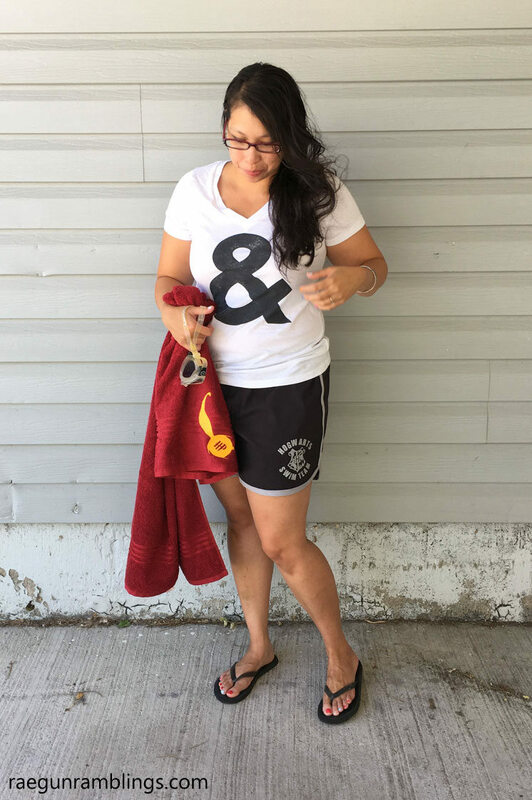 Of course I had to add some Iron-on vinyl again because I just can’t handle plain clothes and I think the Deathly Hallows sign on it is the perfect compliment. And it’s totally just a tad off center ugh but I don’t think I’ll ever but still enough or the shirt will be sitting just so that most people would be able to notice without staring and then they would be the weirdos right!? 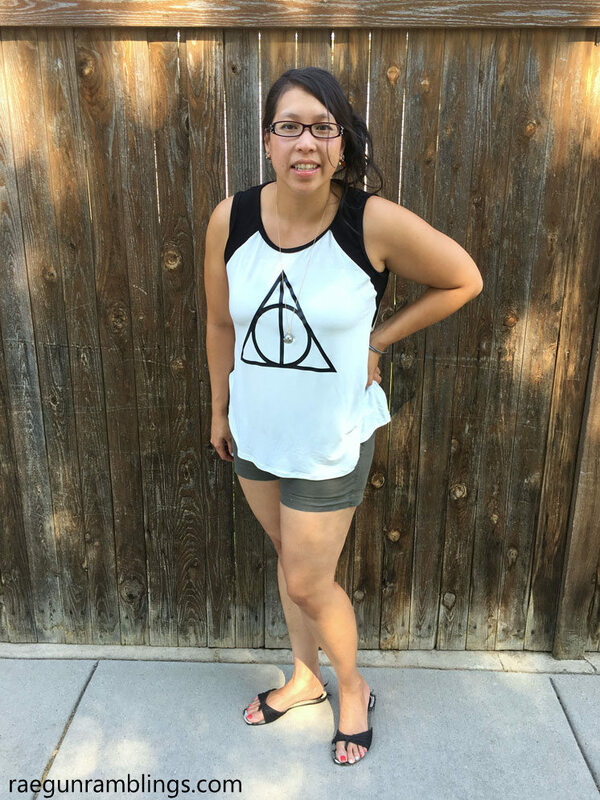 Don’t forget to check out the awesome top that Bev from Flamingo Toes made! We would love you to join us by tagging your selfish sewing with #sewourstash and challenging ourselves to sew at least one wearable item each month for ourselves. And there’s still time to enter the Happy Harry Potter giveways! They are amazing guys! LOVE!! These are both so cute Marissa! 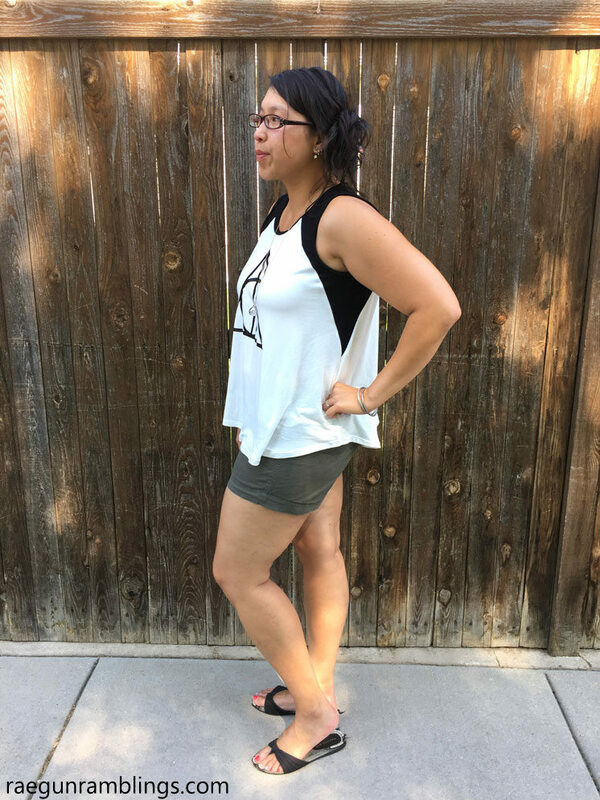 Those shorts are so fun and I really like the top too – I need to check out that pattern!